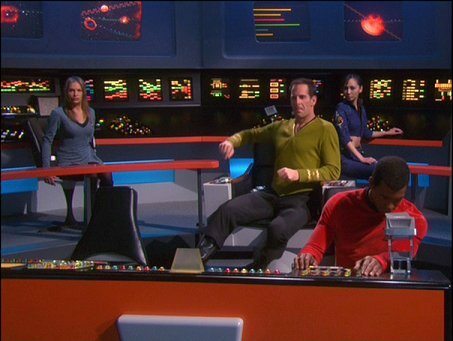 The Five Best Star Trek Episodes Ever! After 12 years away from the small screen, Star Trek returns on Sunday 24th September with Star Trek: Discovery. While we have had the re-boot J.J.-verse in that time, with mixed success, sci-fi fans have been sorely missing one of the most popular shows to ever grace our televisions. To celebrate this beloved franchise I’ve taken a look back at what I think is the best episode from each series and why you should watch it. Kirk and the Enterprise respond to distress signals from outposts along the Romulan Neutral Zone and discover they are being wiped out one by one. On the surface this episode is a standoff between two experienced commanders who are trying to force the other into a mistake. It reminds me of The Hunt for Red October as both ships hunt and avoid each other, the Romulans with their cloaking device having the advantage and Kirk relying on his wits and the experience of his crew. A deeper look at the episode reveals a quintessential social issue at the heart of the episode. 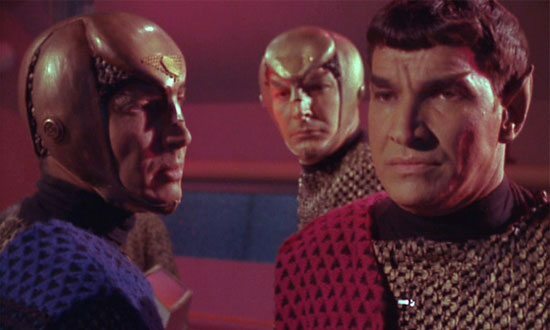 The Romulans turn out to look like Vulcans, leaving members of the crew with doubts about Spock’s loyalties and open racism regarding his heritage, mirroring the social changes occurring in the America in the 1960s. This type of subtext is what made Star Trek so popular, tackling current affairs in a science fiction setting. Balance of Terror is enjoyable on multiple levels. 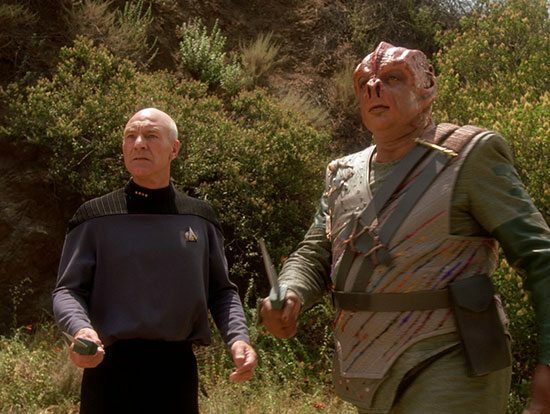 Picard and the Enterprise-D are sent to respond to a signal from a strange alien race call the Children of Tama. The universal translator can interpret their words but with no apparent meaning to them communication is impossible. Frustrated, the alien Captain (played by Paul Winfield who played Captain Terrell in the near perfect Wrath of Khan) beams himself and Picard to the planet surface blocking any attempts by the Enterprise to rescue their Captain. Where is the Best of Both Worlds?! I can hear you screaming. Truthfully, I think it is a very good episode but overrated. It’s memorable only for the proper introduction to the Borg and war and the second part always felt like an anti-climax after such a good first part. Introducing an enemy that cannot and will not be reasoned with just seemed to be anti-Star Trek to me. Darmok on the other hand is what Star Trek is all about. An alien race so desperate to make contact that they go to extreme measures in order to make themselves understood and build a friendly alliance. It shows the world that very different people can come together in stressful circumstance and build an understanding and become friends. That was Gene Rodenberry’s perfect human future and this episode just sums it up perfectly. With war against the Dominion imminent, Sisko grants shore leave on Deep Space Nine to General Martok and his men. Martok and an entire Klingon fleet decloaks and it soon becomes obvious that the crew of Deep Space Nine are in over their heads as Martok’s battle-thirsty men run amok in the Bajor system. Sisko turns to one man who understands these particular allies, Worf. This is where the black sheep of the Star Trek family stepped up a notch. Not content with having a darker tone already, the series becomes bleaker and more focused on war and its effects on civilians and families from this point on. DS9 was the hardest to pick a stand out episode, there are so many good episodes and it is often overlooked in favour of its predecessor, TNG. I know, I’ve said Star Trek isn’t about war and misery but somehow it works for this series. 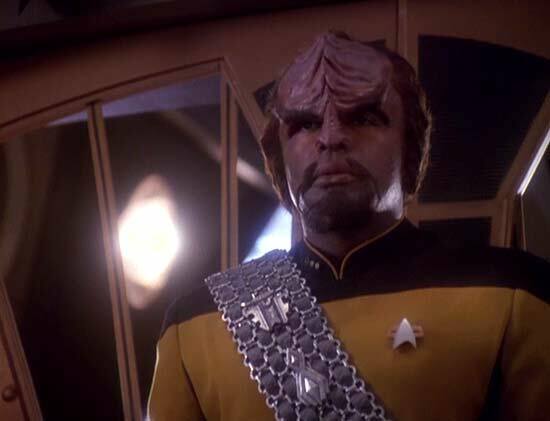 It’s immersive and drags you in and Worf joining the crew starts it off. After the destruction of the Enterprise in Generations he’s lost and trying to find his place in the galaxy, something a lot of us can relate to I’m sure (but on a planetary scale). Through his journey in this episode the viewer is able to see that because one thing has come to an end it doesn’t mean that we can’t or won’t fit in elsewhere. It gives us all hope that just because life can take drastic turns there is still good and acceptance in others. On the other side of the galaxy Voyager encounters an alien race called the Krenim, their flagship is capable of altering the timeline, which they are doing in order to restore their empire, but their commander has much deeper, personal reasons for restoring his fallen civilisation. 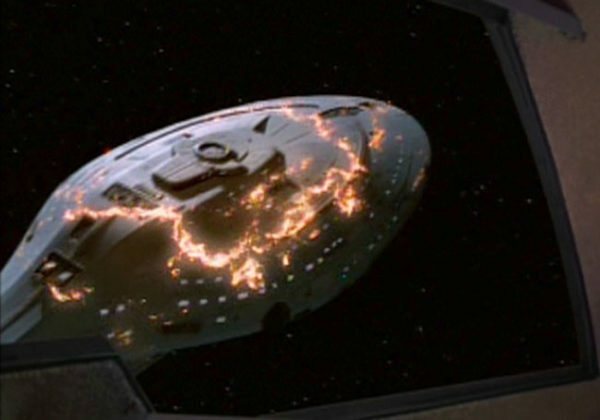 Due to a recent shield upgrade, the crew of Voyager find themselves immune to these changes in timelines and seek to put an end to the Krenim’s monster weapon. Voyager for me was much like Ensign Harry Kim, pretty forgettable, a little dull but inoffensive with the exception of a few stellar (pun intended) episodes. The Year of Hell is an exceptional episode that focuses on Voyager’s isolation as well as the viewer seeing Janeway at her most resourceful, most gritty, most relentless and most stubborn. This is simply a tale of surviving and doing what it takes for the sake of her crew and their future. While it does touch on the horrors of battle the focus remains on the strength and ideals of the Federation and avoids the darkness of war that Deep Space Nine willingly flirted with. If you want to cherry pick an episode of Voyager, look no further. In the mirror universe, First Officer Archer has heard rumblings of a powerful discovery that could give Earth’s empire and himself the ultimate advantage in any battle. The USS Defiant from the Original Series episode ‘The Tholian Web’ has been recovered and Archer will do whatever it takes to make sure he acquires that ship. Forget mirroring the social injustices of the era, forget highlighting the very best of humankind in Gene Roddenberry’s idyllic future, this episode is science fiction at its most fun. In a Mirror Darkly shows off the writer’s love for Star Trek by linking Enterprise to a TOS episode and pulling it off flawlessly. As fans we get to see the original sets reproduced to such detail that we feel all fuzzy and warm inside. But the main takeaway, it’s just a good well written episode that has the viewer on the edge of their seats as we see the evil incarnations of the NX-01’s crew backstab, be cruel, oppress and kill anything to claw their way up the ladder of power within that universe. SEE ALSO: The Five Worst Star Trek Episodes Ever! Don’t agree with your DS9 pick. In The Pale Moonlight, Far Beyond The Stars or The Visitor would be my top three DS9 picks. All of them are head and shoulders above Way of the Warrior. In the Pale Moonlight was very close to being in, it is an excellent episode. I’ll have to disagree with Far Beyond the Stars, it just didn’t work for me as a stand out candidate and The Visitor is also very good. I just felt The Way of the Warrior propelled DS9 onto bigger and better things, it was a game changer for the show.